Jack Mogens thinks he's got it all figured out: He has his batting routine down, and now that he's in sixth grade, he has a lock on a starting spot in Little League. (Well, almost. Okay, not really. It's a two-man race, though, so he has a shot.) And if he can manage to have a not-totally-embarrassing conversation with Katie, his team's killer shortstop, he'll be golden. 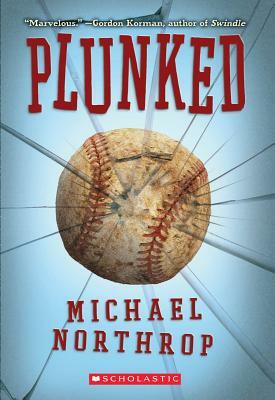 But when a powerful stray pitch turns his world upside down, Jack discovers it's going to take more than a love of baseball to get back his game. Michael Northrop is the New York Times bestselling author of TombQuest, an epic book and game adventure series featuring the magic of ancient Egypt. He is also the author of Trapped, an Indie Next List selection, and Plunked, a New York Public Library 100 Titles for Reading and Sharing selection and an NPR Backseat Book Club pick. An editor at Sports Illustrated Kids for many years, he now writes full-time from his home in New York City. Learn more at michaelnorthrop.net.